Science Editor serves as a forum for the exchange of information and ideas among professionals concerned with editing and publishing in the sciences. Articles related to peer review studies, editorial processes, publication ethics, evaluating article impact, and other items of special interest to the journal’s readers are encouraged. The mission of Science Editor is to provide editors and staff with the knowledge, skills, and concepts they need to run the best version of their journal in pursuit of improving the scientific literature. Submit manuscript files as email attachments to Jonathan Schultz, Editor-in-Chief, at scienceeditor@councilscienceeditors.org. All material is subject to review and editing by editors and peer reviewers, when appropriate. Acceptance is not guaranteed, and editors may suggest revisions. The following article types are considered for publication in Science Editor. Presubmission inquires and proposals are encouraged and can be submitted by email to scienceeditor@councilscienceeditors.org. Unless otherwise noted, submissions should be ~700–2200 words, and figures, tables, and references are strongly encouraged as appropriate. Original Research. The editors of Science Editor strongly encourage the submission of original editorial research for peer review and consideration. 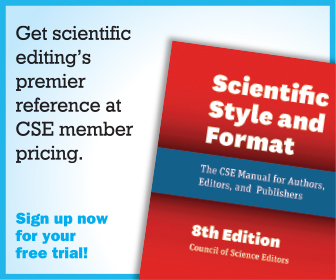 Please submit manuscripts in the style recommended by Scientific Style and Format, 8th edition [link], with references numbered in the order of citation. All material is subject to review and editing by editors and peer reviewers and acceptance is not guaranteed. The word limit for original research articles is 5000 words and may include up to 10 display items (figures and tables). Supplemental material may be included. Commentary. Commentaries are articles that critique or complement original editorial research published elsewhere. Commentaries can be written independently of the original published work, or the authors of the research may discuss aspects of their work more suited to the Science Editor readership. Case Studies. One of the best aspects of Council of Science Editors is the opportunity to learn from colleagues and their experiences. Authors are invited to share their unbiased experiences; for example, implementing a new standard, switching hosting platforms, or implementing a new article format or review process. The sharing of both positive and negative experiences is encouraged. Essays is a broad category of articles that covers topics and ideas in depth, either through opinion or reporting or a combination of the two. These articles serve as a forum to discuss major developments or advances, controversies, the need for policy changes or new initiatives, and other areas of interest to editors and journals. Fire of the Week. The Fire of the Week column is intended as a place to share unique and/or particularly challenging situations members have encountered in the course of their work, that have the potential to teach others how to manage similar challenges when they arise. Good examples may be author or reviewer misconduct, personnel issues (such as conflict between two team members), media coverage of your publication that didn’t go as you would have hoped, etc. Describe the “fire”. What happened? Who was involved? How did the situation arise? Why was the situation unique or challenging? Where did you go/what resources did you utilize to arrive at a solution? How did you resolve the problem? What was the outcome? What other possibilities did you consider? Why did you decide against those? Will you change any of your policies or day-to-day procedures based on this occurrence? Do you have advice for others facing the same situation? Primers are a category of educational articles intended to serve as a reference point for editors and publication staff. These articles are intended to explain a new concept or standard in a clear and enjoyable manner. Readers are encouraged to submit suggestions for topics that would be appropriate for Primers. Perspectives are designed to explore and represent the many different jobs and responsibilities encompassed by the term “editor”. Perspective articles can include first-person narratives, profiles, or interviews. Departments & News are recurring columns such a Book Reviews and Council News. These columns are typically solicited, although suggestions and proposals are considered.